Best potatoes ever right here…the best. 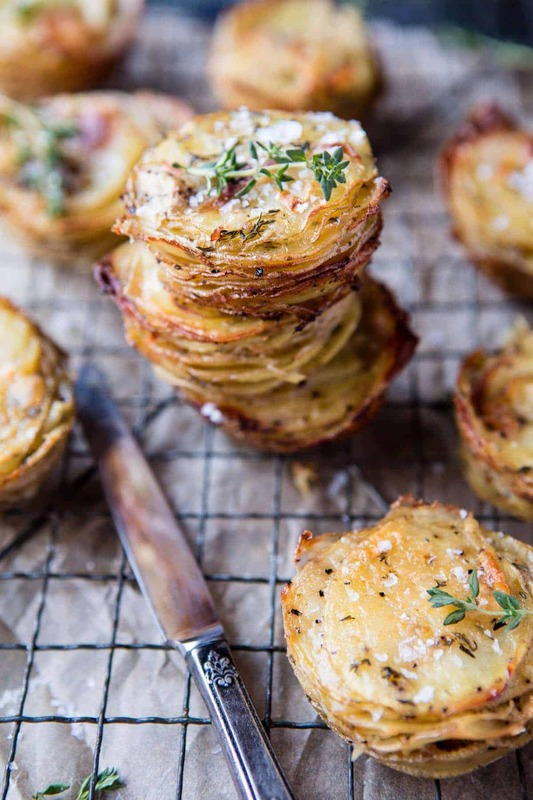 crispy cheesy potatoes stacks from Half Baked Harvest on Vimeo. 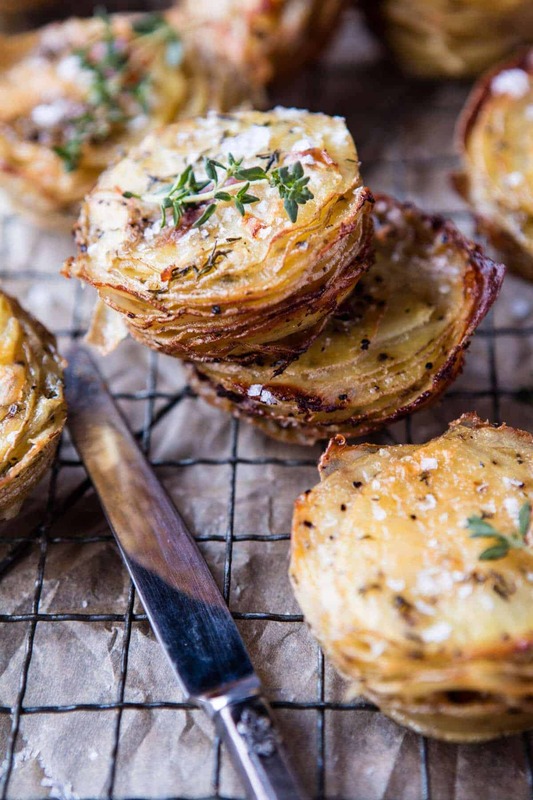 These crispy cheesy potatoes stacks are the most amazing compliment to any main. They’re crisp on the edges, soft in the center, just a little bit cheesy (but not overwhelmingly so), with the right amount of salty flavor, and oh so buttery! Honestly, this is what I call the perfect savory side dish. My mom says you can’t even call them a side dish…she ate them exclusively as a meal…and loved every bite! No one and I mean NO ONE, can resist these cut stacks. Just like french fries, these stacks are addicting, you may just end up like mom, eating potatoes for dinner. They are seriously that good. I’ve decided that whoever came up with the idea to very thinly slice potatoes, layer them together and then bake them with things like butter, cheese and thyme is just a genius. It’s the best combo! And while they do have simple flavors, they’re flavors that pretty much everyone loves. I mean, I know everybody in MY family is crazy for anything with potatoes, cheese and salt. <–I have some seriously picky eaters to work with and this is about as far as some siblings flavor pallets will go. Yikes! So, do you guys remember that beef tenderloin I posted last week? If by chance you missed that post, I highly recommend checking it out, especially if you’re on the search for an easy holiday main course, the roast is delicious. So I obviously needed a good side for my roast, and since I like to keep things pretty traditional for my family’s Christmas Eve and Christmas Day dinners, potatoes are always on the table…both nights actually. As I mentioned in my post, we always have beef tenderloin or some form of steak on Christmas Eve. Typically for the main side dish I’ll make my mom’s recipe for cheesy potatoes. My entire family loves them, so it’s kind of a must. Or it was a must until I made these, because man, these potatoes are just insane, and they require no canned soup products…which to be honest, scares the heck out of me. I only ever use canned soup for mom’s cheesy potato recipe, cause well, it’s tradition and I have a hard time breaking traditions. Maybe I should try to develop a recipe for cheesy potatoes (the casserole kind) minus the canned soup. Yup, I should totally do that. Next year for sure! Anyway, these are probably the simplest potatoes ever. Just potatoes, fresh oregano, thyme, butter, cheese, salt and pepper. Seven ingredients and so delish. The secret is definitely the thinly sliced potatoes. If you don’t have a mandoline, I recommend investing in one now, it’s really the only way to get the paper-thin potato slices we’re looking for here. If you have a food processor, I think there’s an attachment that will slice them this way too! Thinly slicing the potatoes allows to them to get extra crisp on the outside, almost potato chip like, yet the center of the stacks remains soft with cheesy potato goodness. It’s kind of the best of both worlds. 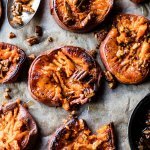 If you’re wanting to make these in advance, just roast the potatoes, store them in the fridge and then warm in the oven just before serving. You know something? These are obviously best right out of the oven, all hot and gooey, but even when eaten at room temperature, or my least favorite choice – cold, these are still just as addicting. What is it about potatoes and salt? Literally the best combo to ever be put together. I will be making these this Christmas without a doubt. My family devoured the leftover batches and loved them. Speaking of which, how good would these be leftover for breakfast on Christmas morning with a side of eggs? Oh my gosh. I am totally doing that! My brothers are going to love me this Christmas…all their favorites are happening! These can be roasted up to 3 days in advanced and warmed in a 350 degree F. oven for 10 minutes or until warm. Preheat the oven 400 degrees F. Lightly grease a 12 cup muffin tin. Cut the potatoes using a mandoline. In a medium bowl, toss together the potatoes, oregano, thyme, butter, salt and pepper. Add the cheese and toss again. 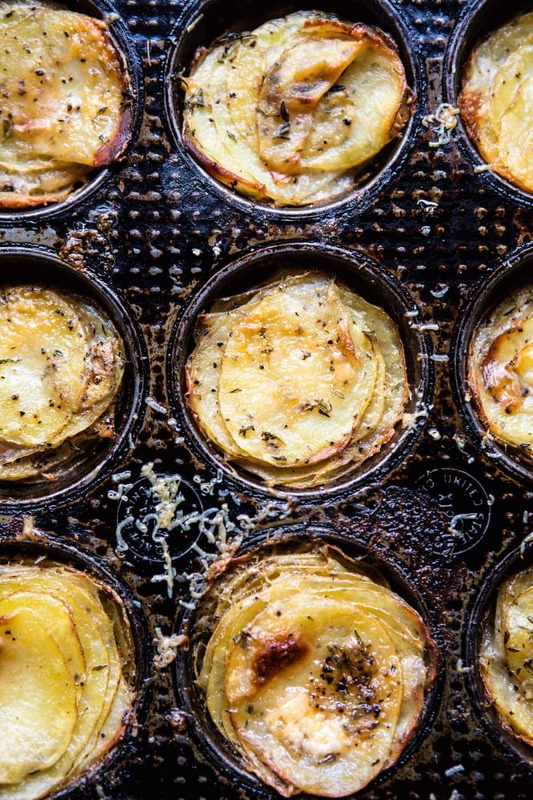 Layer the potatoes evenly among the prepared muffin tin, stacking the layers all the way to the top. The potatoes will shrink down as they cook. Cover with foil and place on a baking sheet. Transfer to the oven and roast for 30 minutes. Remove the foil and continue cooking another 20-25 minutes or until the potatoes are tender and golden. Run a butter knife around the edges of the of each stack to release them. Serve immediately, sprinkled with a little sea salt. That is some serious potato stack awesomeness up there. Totally agree to your mom ! I wish you have a pleasant day ! yes, I would def eat these all by myself in one sitting and never feel guilty about it. It’s potatoes, see, and I loose my restraint where they are involved!! They are always hard to stop my self from eating! YES to having these as leftovers for breakfast! Like I was literaly thinking that the whole time then you said it at the end! 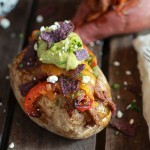 I might have to sub my usual roasted rosemary potatoes for this next weekend! Such a perfect leftover for breakfast! Haha!! Hope you love them Amanda!! I’m reading this at 4am and wondering if it’s too early to try this recipe! Nope, I agree! This recipe combines the best of everything! Haha! Thanks so much!! 4am! Thats awesome! Awh thats a bummer you won’t be able to make them for christmas!! But I hope you love them when you do!! Yes as much as we don’t like to admit it moms really are always right! You mention having leftovers…how would you heat them up IF there actually were leftovers? These look so good! HI! I like to sue the oven, but the microwave works too. Let me know if you have questions. Hope you love these! Thank you! These look delicious and your breakfast idea sounds amazing! I will certainly make these but maybe a half recipe because I live alone. I’m afraid there will be no left overs. After looking at the pictures again maybe a fourth of the recipe? Hey Nancy! making 1/4th of the recipe will be fine…but I would just cut it in half if I where you! lol! Let me know if you have questions. Hope you love these!! What do you mean by prepared pan, sprayed, greased? Yes, sprayed or greased pan, whatever your prefer. Hope you love these! Let me know if you have questions! Don’t we all!!? Potatoes are just amazing! These look so amazing. I have a feeling once I make these I won’t be able to stop eating them! I seriously couldn’t stop! They were too good! I just pictured myself stuffing this into my piehole, Scooby-Doo style. 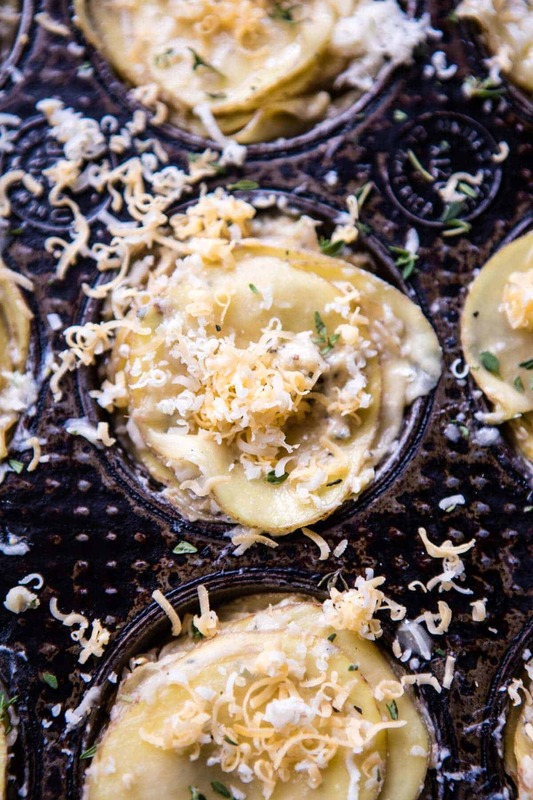 I mean, cheese+carbs+thyme+oily crispness???? Zoinks! haha! Hope you love these! *note to self* – buy mandoline today. . . Sounds perfect!! Hope you love them Jane! Thanks! 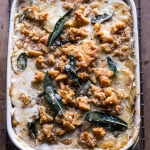 Recipes like this are why a mandolin is on my Christmas list! Also this looks good. I’ll go buy a muffin tin and try them out !! I don’t think its possible, not for me at least! Thanks Erika! If you make them in advance, should they be covered with foil when reheating or leave uncovered? And reheat in the muffin tin? Thanks, they look amazing! Hey Chris! I would cover with foil and leave in the muffin tins. Hope you love these and Merry Christmas! These potatoes just look amazing!! I’ve been pushing buy a mandolin for a long time and looks like I need to buy it so I don’t miss out on such delish dishes. Yes!! You have to try it, and let me know what you think!! 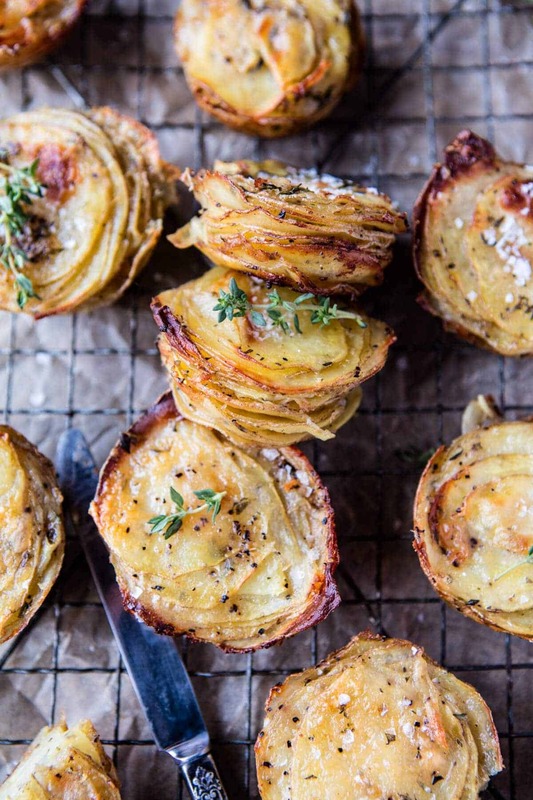 Give me all the potatoes… I love these stacks! If only i didn’t eat them all!! Haha! Thanks Laura! These look so good! I will definitely be trying these soon. I also make cheesy potatoes that call for canned soup, but I found this recipe for homemade canned soup substitute that works perfectly! Thanks so much!! Sounds perfect!! The pictures make it look like the potatoes were cut thinner than 1/8th. Some may have been but for the most part they were about 1/8th! Crispy potatoes + lots of cheese = one seriously awesome combo!! Yum!! Can’t wait to get out the mandolin and make these. Hope you love them Kate!! I love the idea of steak and potatoes for Christmas Eve dinner – simple but so delicious! Yes!! Its a staple at the Gerard household! Awh yay!! Thanks so much!! Hope you get to make them! I just made a test batch this morning! Oh my goodness! These are addictive! Ate a third of them already..lol. Having for lunch with ham,then for dinner..perhaps by themselves….with a glass of wine….see what you’ve done! My potato addiction just got worst! YUM? YES!! SO happy you liked them!! Potato addiction is so a thing, and I have it!! Hey Holly! I have not, but I think red potatoes would be great! Let me know if you have other questions. Hope you love these and Merry Christmas! Did you leave the potatoes unpeeled? Hey Leslie, Yes I leave the potatoes unpeeled. Let me know if you have other questions. Hope you love these and Merry Christmas! Made these last night and the flavor was so spot on – great recipe! Sadly, though, they didn’t turn out crispy at all and were a bit too buttery (I know. Blasphemy. I didn’t even think that was possible). There was probably a teaspoon or so of butter remaining in each muffin slot. The potatoes were soft, but should I have cooked them longer to crisp up? Or maybe a little less butter? What would you recommend? I had a little too much butter as well, Robby. We ended up only eating a few the first night as a result. Covered in foil and baked again the next night. That helped. Some of the shorter stacks were a little burnt on edges, but the stacks that were higher were better. If I make again, I’m probably going to have to eyeball the ratios. Hey Robby!! I would cook them longer and you can of course use a little less butter too. But cooking them longer with get them crisp for sure! Sometimes potatoes just take a little longer to cook. Let me know if you have questions. So glad you loved these! just discovering your blog and your world this morning! when you don’t specify sweet or salted butter, which should I presume the recipe calls for? So I made these the other night and I am currently cooking another batch right now! They are that good. I used 1 large russet potato and 3/4 of a stick of butter along with dried herbs. I didn’t have fresh but I have to say it was amazing! I had some green onions so I cut them really small and added them to the mix. They were almost too crispy the first night so tonight I am cooking them at 380 degrees. Once they were done I put them on a paper towel to soak up some of the butter. Absolutely delicious! The asiago cheese makes them salty but too much. I plan on making them as an appetizer with a little sour cream on top. Love!!! Sounds like this was amazing for you! Thank you so much for making them Jen! Came here at Brown-Eyed Baker’s suggestion, and I’m so glad I did! The recipe’s title was too irresistible to not take a look-see. I don’t like oregano or thyme, so I’ll be omitting those, but I just know it will be spectacular with only the butter and cheese. So happy you found my site thank to her! Thank you so much! These are so incredibly delicious! This is the second time this week I am making them and made a mental note to always have russet potatoes and asiago cheese in the house. Haha that is so great! I’m glad you are loving these Mary Beth, thank you!! Mine are baking now! Sub’d parm for Asiago. Used garlic powder, fresh ground pepper, and italian herb seasoning. Can’t wait! Sounds amazing! Hope you love it! 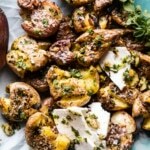 How many potatoes does this recipe need (generally)? The recipe just says 4 inch potatoes. I made these at Christmas I think I used 4-5 potatoes man they were good and now I’m craving them again! So sorry! You need about 4 potatoes. Recipe is all fixed! 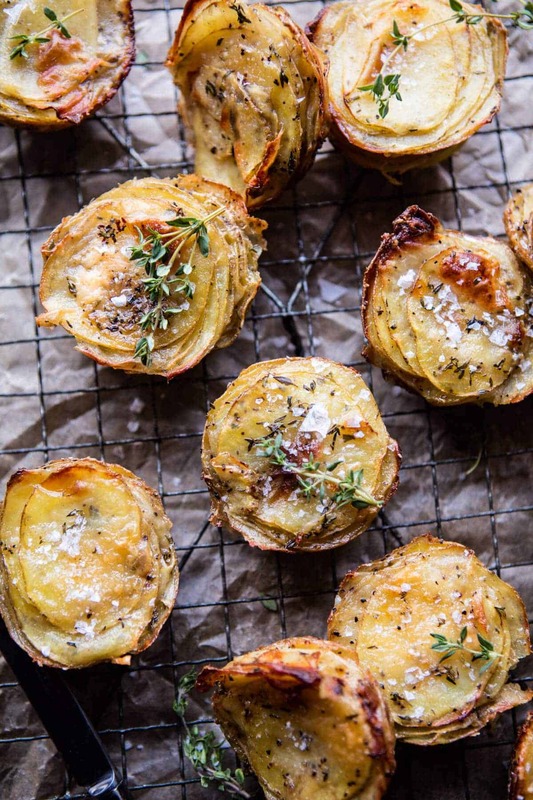 I love any potatoes but these look amazing. I was looking for a good vegetable side recipe and this is it. I can’t wait to make them. I hope you absolutely love these Edwina! Thank you! I made these and all my family loved them. They were so good we all wished there were more. Now I need to make them again soon. So delicious. That is amazing! 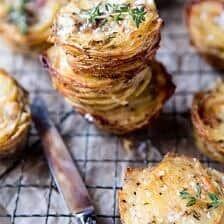 I am so thrilled you and your family loved these potato stacks! Thank you Deidre! I’ve made Frances Malman’s Dominó Potatoes numerous times and that recipe calls for clarified butter so I’m going to try it that way. Since I live in Mexico I only have fresh Mexican oregano which is stronger so maybe I’ll cut it in half. Doubt I can find Asiago so will Parm work as a sub? Just wondering if you could freeze these after roasting? Hey! My family and I are snowed in and I really want to make your potatoes but I only have dried thyme and oregano. Would it work to use dried? Delicious!! Will 100% make again. My whole family loved these so much! Hi Deb! I hope you loved this recipe! Thank you! My family LOVED them and even my husband who usually is not very much “into potatoes”, finished them all. Easy to make, looking very nice and – great taste! Fröhliche Weihnachten – and MERRY CHRISTMAS! I am so glad everyone loved these Natascha! Thank you! yum! i made these with sweet potatoes and substituted rosemary for oregano, and parmesean for the asiago–which, if you do that, just know that after i took the aluminum foil off, they were done after 12 minutes instead of 20-25 minutes. hello! I only have a silicone muffin tray. would that work or should i buy a metal tin?